Hoop nets and bait traps must be attached to a tag that remains above the water's surface with the recreational fisher's full name and place of residence clearly and legibly written. You must not leave a line or rod unattended. Your line must be in sight and within 50m of you. defined as up to 6 unbaited lures with hooks less than 2cm in length, attached to a line with a total rig length of up to 3m. In inland waters, each licensed or exempt fisher may use a maximum of 2 lines per person (with or without attached rods), with no more than 2 hooks or 1 bait jig attached to each line. Baited lines are lines without hooks, Baited lines must not have any hooks tied to them. A maximum of 10 baited likes (per licenced or exempt fisher) may be used and possessed in any inland water. Hand-operated suction bait pumps with a barrel diameter not exceeding 8.5cm may be used. A sieve can be used in conjunction with the pump. A maximum of one bait pump (per licensed or exempt fisher) can be used in inland waters. You must not use a bait pump as a tool to dig with. A bait net must not exceed 6m in length. Hauling ropes attached to each end also must not exceed 6m. Bait nets do not include cast nets, which are illegal equipment. A licensed or exempt fisher can use a maximum of 1 bait net to collect bait from permitted inland waters. Bait nets must not be used in restricted waters. Fitzroy River downstream from the boat ramp. Wimmera River downstream from the bridge on the Stawell-Marnoo Road to Lake Hindmarsh. You must not tow, drag or haul any net behind a motor under propulsion in any Victorian waters, marine or inland. Barbless gaffs, including barbless flying gaffs, can only be used to assist anglers to take or land fish (other than invertebrates). A gaff can only be used with a rod and line or handline. All types of gaffs must be barbless. Barbed gaffs are illegal. Funnel entrance diameter must not exceed 5cm. The height of the trap must be no more than 25cm. The size of the trap must be less than 25cm wide and 50cm long. A maximum of 2 labelled bait traps (per licensed or exempt fisher) may be used in or on any inland water. A dip net consists of an open-faced net with a width and depth not exceeding 90cm, attached to a handle. A licensed or exempt fisher can use 1 dip net to take a variety of fish or invertebrate species, with or without a light. A hoop net is a cylindrical net open at the top, consisting of 1 or 2 hoops not exceeding 77cm in diameter. The net must not have a drop of more than 50cm. Nets must be labelled if set from a boat or left unattended. The label must float at the water's surface, and must clearly display the recreational fisher's full name and residential address. In all other inland waters, a combined maximum total of 10 hoop nets and/or open top lift nets can be used. any internal device. They are designed for catching yabbies. Open top lift nets can be used in private waters such as dams. 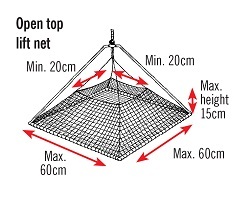 In all other inland waters a combined maximum total of 10 hoop net and/or open top lift nets can be used. These are permitted for use by recreational fishers if they have a hand cranking mechanism, are fitted to a conventional recreational fishing rod and can be hand held when retrieving fish. Other types of powered devices are considered commercial fishing equipment and cannot be used by recreational fishers. If a person with a disability has a legitimate need to use a powered device other than a hand-cranked electric reel, they may apply for a permit from the VFA.